Arpad Elo’s a physicist, astronomer and chess master that developed a rating system for rating chess players. Elo is a ratio or a system for relative valuation of the strength of the player, ELO coefficient is calculated by a certain method. The method can be adapted in other sports like football, but need some modification. The system assumes that the strength of the players is equally distributed after making adjustments after each game. The method is very simple. If player A has a much higher rating to player B, then the expectation is that player A wins, taken by another player a certain number of points.If the weaker player wins, it will take a lot more points as it defeated a strong opponent.In 1997, Bob Runyan set formula, including home field advantage of teams and goal difference with victory.More about Elo rating can be found on World Football Elo Ratings, Elo rating system. All teams start with the same number of points 1000, after each clash, their rating is calculated by the following formula. K is a constant that determines the extent to which the result is reflected in the rating. Ra is the current rating of the home team and Rb is current rating of away team. In almost every sport there is a home-field advantage. Perhaps this is because of the fans, that they’re sleeping with their own beds, or perhaps some other factors. In football, there is always a host appreciable advantage. While looking for information on the Internet, I found a two similar system using Elo ration. One that is used by FIFA, is adding 100 points to the rating of the host when calculating the expected result. The other method, we use on prosoccer.eu to add points depending on the league. 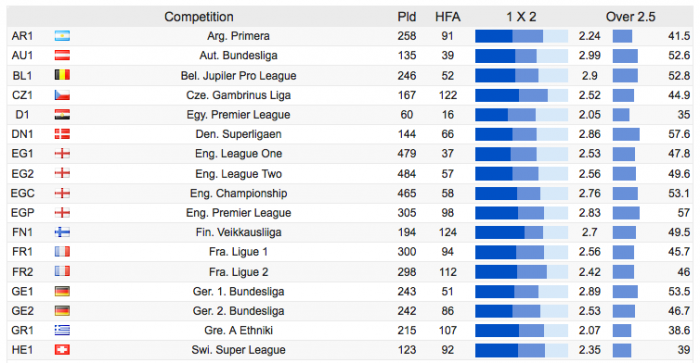 Someone Championships as Finnish have a clear home-field advantage, while in the Bundesliga opposite. To calculate Elo points that should add we find the percentage of home wins in the last season for example. If 62 percent of the game ended with a victory, we substitute Ea 0.62 and solve the equation. The result is 62% hfa = 90 points. Once we have hfa, for each championship our forecasts are much more accurate. Home court advantage is added to our system as a temporary boost of the Elo rating of the home team. Unlike chess in football, scoring margin of victory is important. Whether victory is a 1-0 or 5-0 is important. In our method recognize this factor by multiplying the K-factor of the square root of goal difference. If the result is equal to multiplication by 1. At the moment we have not found the optimal method for predicting games that are played for cups. This is one of the reasons why you do not offer predictions about them. Elo other methods add weight to Ranew different depending on whether the game is the championship or play for one of the cups. We are working on this. After the end of each tournament, several teams fall in the lower divisions and their places are filled respectively by the other teams. In this case, new teams are assimilated by Elo points with other teams in the division. The calculation of the Elo rating significantly improves the success rate of predictions. The obtained results are supplied to the system, which is based on the Poisson distribution. With its help determine rates for all types of forecasts. After an additional filter “value bets“, can assimilate only winning predictions that turn into profit.